Chicks on Speed, 'Sleep Symphony', 2015. Courtesy of the artists and 401contemporary, Berlin. Curated by Gertrude Contemporary’s artistic director, Mark Feary, as part of Melbourne Festival, this exhibition brings together artwork that explores the notion of the sleeping figure in contemporary art. Expanding on that symbolism, the works further examine the role of the subconscious, delirium and altered states. Have you ever stayed awake for a few days and seen where that’s driven you? It’s either euphoric or the arbiter of despair – you see the world in extremes – majestically beautiful, or as dank as the homes of sewer rats. 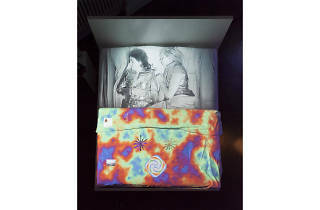 Other artists approach sleep through the concept of time – how much is that buzzing screen affecting your sleep? How many hours can you work in a day? Do you ever wake the person you’re sleeping next to with a conversation you think you’re having in real life (you’re in a dream)? How do those hours you sleep affect your waking life? One of the highlights of the exhibition include new works by Welsh-Australian artist, Lee Hadwin, who since the age of four has been drawing in his sleep – an anomaly which has confounded scientists, since the artist doesn’t draw in his waking life. For the first time in Melbourne, Gertrude will be displaying a selection of Hadwin’s “sleep drawings”. Some are intricate as hell, while others are scrawlings, but each reveal the artists subconscious in really strange and sometimes profound ways. Imagine being able to draw Marilyn Monroe in your sleep! You can’t tell if he’s thinking about Andy Warhol or Monroe herself. The ambiguity is what’ll get you wondering. Also featured in the exhibition is Chicks on Speed – remember that song, ‘We Don't Play Guitars’? Yeah, those chicks, on speed. For the exhibition, they’ve collaborated with a science lab in Western Australia to monitor their sleeping patterns, which have then been transposed into a experimental music piece that plays throughout the gallery. 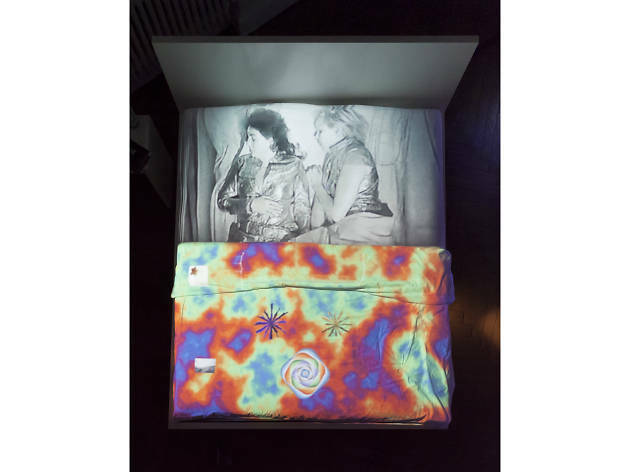 The show also features an equivocal installation by the pair (Melissa Logan and Alex Murray-Leslie), which sees the two artists sleeping under a psychedelic doona cover, serving as a metaphor for their dreamscapes. A filmic installation work by Venezuelan-born, New York-based artist Javier Téllez, will also feature in the exhibition. It’s a remake of the 1920s surrealist, silent horror film, The Cabinet of Caligari. Aptly titled 'Caligari and the Sleepwalker' (Caligari und der Schlafwandler), the work sees the artist collaborate with amateur actors and patients in a mental health ward in Berlin, to examine ideas around sanity and delusion – reality and what may not be so real. Originally commissioned by the House of World Cultures in Berlin, this is the first time the work is being shown in Melbourne. Sleep-aid is also explored in Zzzzz, with US artist, Erica Spitzer Rasmussen presenting a sculptural object in the form of a dress made of thousands of prescriptions for sleeping tablets. The object, however, is stunningly delicate, and like all great art, has a meaning (pardon the pun) sewn through it – in this case, it’s a little darker, but effective in making us question our reliance on synthetic aids. Where’s valerian when you need it? Other artists participating in the exhibition include The Telepathy Project (who have enacted countless sleep and subconscious-inspired performances and events), Kate Mitchell, whose meditations on the subconscious will certainly come to the fore, Mabel Juli, a renowned Barlinyin painter, and Barbora Kleinhamplová with Tereza Stejskalová, the former being a Czech multimedia and performance artist whose work frequently questions political realities and group mentalities in relation to the psychology of social spaces. It’s a layered exhibition and really worth taking your time to see. Make sure you’re well rested before seeing it, unless of course you live by Bon Jovi’s motto of sleeping when you’re dead.